Anne Greene here. A castle is a fortified structure built during the middle ages, usually a private residence of a lord or noble. In Scotland, earlier fortifications included hill forts, brochs (as featured in my Scottish historical, Masquerade Marriage), and duns. 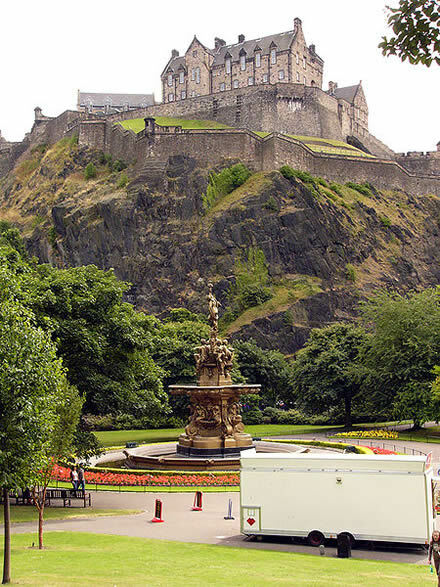 Many castles were built on the site of these earlier buildings. 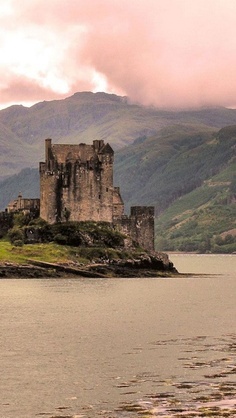 From 1100 AD on, there have been over 2,000 castles built in Scotland. Home to a thriving community, the stone rooms bustled with life, color and sound. Inside the kitchen a small army prepared food for the nobles. The lead cook, the undercook and the bakers composed the top tier of kitchen workers. Lardeners stocked the kitchen. Poulterers prepared the birds. Bakers baked fresh bread in giant ovens. Fruit and vegetables grew in the castle gardens and orchards. Meat came from the popular hunts in the deer parks. Spits in massive open fireplaces roasted boar. The nobles enjoyed hunting and hawking. The ladies engaged in embroidery, music and weaving. During long evenings, musicians and singers entertained. With endless hours of service to the nobles, life for the peasants played out quite differently. A castle had no standard size, shape or structure. Builders designed to suit the site, the noble’s budget and the military dangers of the area. High walls and solid towers provided the castle’s main defense against attacking soldiers. Some walls were eight feet thick. 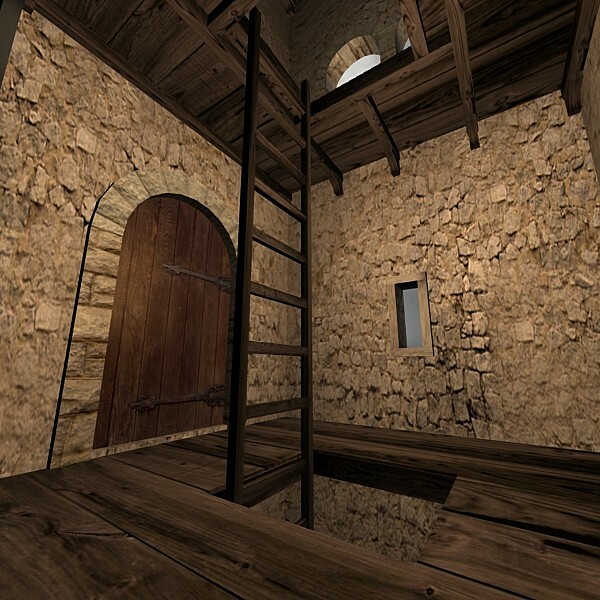 Builders built castles on the highest point of land available, so attacking warriors must struggle up a steep slope or scale a cliff to reach the stronghold, while facing a devastating shower of arrows from defenders on the parapets. A water-filled moat often enclosed the castle. A drawbridge spanned the moat. In its down position the drawbridge closed a pit and allowed access to the castle. The pit also worked as a cell for prisoners. 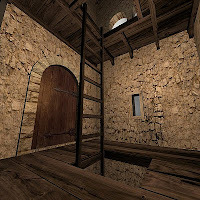 A strong oak grille called a portcullis further protected the castle gates. High walls enclosed a number of courtyards, each called a bailey. During attacks, animals and villagers sheltered inside a bailey. In peacetime, baileys housed workshops for carpenters, candle makers, weavers, and other workers at the castle. Wells, dug into the rock inside the baileys, provided water. A nobleman and his family, together with his knights, men-at-arms, servants and friends lived in the heart of the castle - in the keep. The noble household often passed their time listening to the songs and poems of troubadours. Sometimes a priest read to them the latest teachings on philosophy and science. In a castle under siege, defenders retreated to the keep and fought to the death. Castles protected nearby towns, and the nobleman had the responsibility of protecting the town folk. You will find this in my book, Marriage By Arrangement which debuts December 6, 2013. Domestic life in a medieval castle centered in the Great Hall. 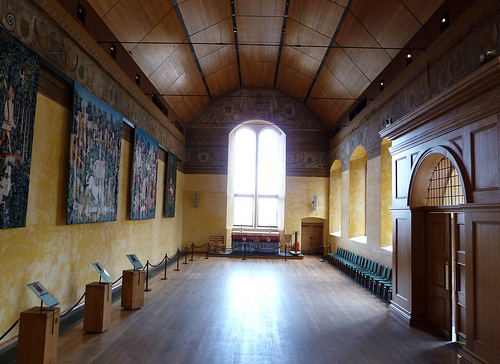 This large hall was the focus of hospitality, celebration and the pleasures of life - including dances, plays or even poetry recitals. During the 1748, when my series, The Scottish Marriage Trilogy, occurred, Scottish castles were no longer fortresses but had evolved into luxurious living quarters for their noble owners. Except for the English soldiers searching for fugitive Highlanders, life was peaceful. On August 14th look for my blog about Servants’ Lives in a Scottish Castle. A Scottish Lord and Lady had many privileges and responsibilities. My ancestors owned a castle in England. Did your ancestors originate in the United Kingdom? Would you have liked living inside a castle? Leave a comment and your email address (in case you win) for a chance to win one of my books. Visit Anne’s new blog Plotters And Pantsers Write To Publish Workshop at www.annegreenewritingteacher.wordpress.com. ANNE GREENE delights in writing about wounded heroes and gutsy heroines. 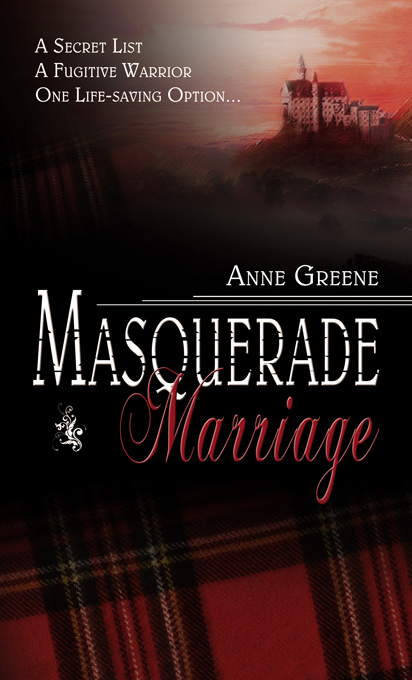 Her second novel, a Scottish historical, Masquerade Marriage, won the New England Reader Choice award, the Laurel Wreath Award, and the Heart of Excellence Award. The sequel Marriage By Arrangement releases in December, 2013. A Texas Christmas Mystery also won several awards. She makes her home in McKinney, Texas. Tim LaHaye led her to the Lord when she was twenty-one and Chuck Swindoll is her Pastor. View Anne’s travel pictures and art work at http://www.AnneGreeneAuthor.com. Anne’s highest hope is that her stories transport the reader to an awesome new world and touch hearts to seek a deeper spiritual relationship with the Lord Jesus. Buy Anne’s books at http://www.PelicanBookGroup.com. Or at http://www.Amazon.com. Food was seasoned with herbs and spices, and sweetened with honey. Sometimes wine was imported from France but usually everyone drank ale. Boys brought wood from the stores to keep the cooking fires lit. Food was seasoned with herbs and spices, and sweetened with honey. Sometimes wine was imported from France but usually everyone drank ale. I don't believe any of my ancestors came from the United Kingdom. 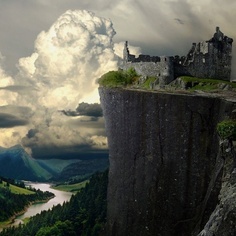 Would love to visit a castle, but they are huge and I'd feel lonely. If it was a functional castle as you describe, there would be too many people and things happening for anyone to feel lonely. Thank you for sharing this part of history. Please enter me in your giveaway. I've taken to Christian historical novels set in medieval times and have enjoyed learning about and dreaming of life in a castle! Oh how I'd love to go visit for a week or two, but I'd miss indoor plumbing, running water, a/c, and light--other than candle/torchlight!! I know I'm a "mutt" in my family heritage. I've a bit of Scottish, Irish, German, English & Cherokee Indian in my blood! Thanks for sharing a great post!